Radiation isn’t the biggest concern. It’s a meltdown of the country’s institutions. Radiation in Tokyo has not reached anything like harmful or even worrisome levels. And, although packaged foods have largely disappeared from convenience stores and some supermarkets, fresh food continues to be widely available. Indeed, there may be too much of it. The chef at the sushi shop where I had lunch on Friday complained that he couldn’t sell all the fish he had stock-piled—people were going home early rather than stopping by for a couple of beers and a round of nigiri-zushi before heading for the station. But this crisis threatens Tokyo’s inhabitants in more subtle ways. Unlike the thousands who actually do live close enough to the Fukushima plant that they are already at risk or the hundreds of thousands who will be at risk if the efforts to contain the fallout fail, Tokyo-ites, I believe, fear institutions cracking under stress. While Japan’s citizenry have not only performed admirably but in a manner that has evoked something close to awe in much of the world, the country’s formal institutions—banks, governments, power companies—have not. A close friend in Sendai, which did not escape disaster, said this in an e-mail: “We know we are losing our central government or government is losing us.” My friend was giving voice to the fears of so many Japanese—not just the hundreds of thousands trapped in and around Sendai but the millions who watch and wait in Tokyo and beyond—that what may buckle in this crisis is not everyday, mundane Japan but Japan’s higher circles and institutions, and, above all, its central government. A formidable intellectual challenge facing all who try to make sense of Japan lies in the seeming contradiction between the continuing strength of everyday Japan and the palpable weakness of the central government. Garbage gets collected; trains run on time; schools graduate literate, numerate, responsible young people; firefighters, police, and medical personnel manage run-of-the-mill emergencies with world-beating efficiency. Yet the county has had six prime ministers in five years and has appeared, since 1991, to lurch from one incoherent policy to another in grappling with the stagnation that set in after the implosion of the so-called bubble economy of the late 1980s. This conundrum nests inside a larger one: how Japanese organizations work so well most of the time without clear chains of authority or identifiable decision-makers. An organization like Tokyo Electric Power (TEPCO)—the operator of the stricken Fukushima plant—fields thousands of competent professionals whose dedication to duty, as we have seen in the last few days, literally involves risking their lives. But TEPCO displays many of the same organizational pathologies that BP, Fannie Mae, and Citicorp have made grimly familiar in the United States: arrogance, influence-buying, and an inability to hear anything from outside a self-constructed echo chamber. As Daniel Aldrich has written for TNR, TEPCO has not only never had to explain its enthusiasm for nuclear power, it has devoted considerable resources to ensuring it would never have to. To be sure, unlike Wall Street’s denizens who created America’s financial crisis, TEPCO’s decision-makers were not prepared to sacrifice every notion of the wider good to personal enrichment. No one at TEPCO took bribes or cut corners in order to line their own pockets. Rather, the corruption—if one can call it that—is more subtle. Because TEPCO’s managers confused TEPCO’s organizational well-being with Japan’s wider good, they lost sight of their real mission: to provide reliable, safe supplies of electric power. It happened because there was no one who could hold them to account, no one who could force them to articulate just how placing nuclear power plants on some of the world’s most seismically unstable land helped serve Japan. Writ large, the tragic flaw in modern Japan’s governing setup has been the weakness of institutions that would force Japan’s bureaucrats to think through what they are doing and why they are doing it. Ironically, Prime Minister Naoto Kan’s Democratic Party of Japan (DPJ) was swept into power back in September 2009 partly because it promised explicitly to address this problem and to place ultimate decision-making authority in the hands of politicians accountable to an electorate rather than with unaccountable bureaucracies such as TEPCO. Reactionary forces in Japan had, until the earthquake, stymied the DPJ, and, as I argued previously for TNR, Washington has effectively allied itself with these forces. But, while one hesitates during a period of immense suffering to talk of such banalities as silver linings, this catastrophe has made obvious in the clearest possible way that Japan needs robust institutions of accountability. And, while the government has understandably given the impression of being overwhelmed at times by this catastrophe, it is also obvious that its leaders understand this. Kan has called TEPCO’s managers on the carpet in a way that can hardly be imagined coming from earlier prime ministers, and his Chief Cabinet Secretary, Yukio Edana, has set an exemplary—and unprecedented for Japan—standard of frankness and clarity in his frequent press conferences. 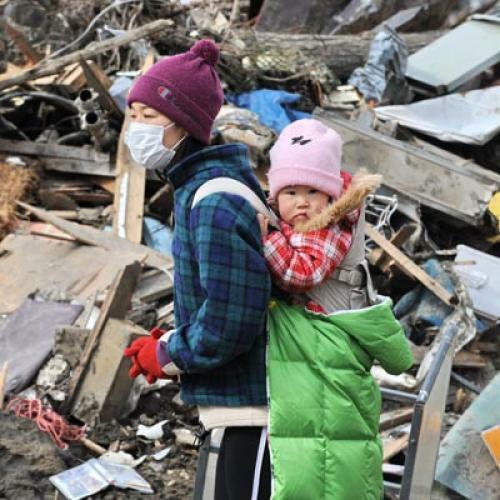 Of course, good intentions and a determination to impose accountability on the likes of TEPCO do not in and of themselves deliver food and gasoline to tens of thousands of desperate people—particularly when, as van Wolferen notes, the DPJ has “hardly had any time to build the political infrastructure” neglected by its predecessors. But, in its attempts to alleviate the despair to which my friend in Sendai gave voice, the DPJ is striving mightily to address the fears that Japan’s citizens have not only of a nuclear meltdown, but of a meltdown of its higher institutions. And, in doing so, it can tap the self-sacrifice and heroism that its citizenry have displayed amidst the spectacle of whole cities reduced to rubble and hundreds of thousands made homeless. R. Taggart Murphy is a professor in the MBA Program in International Business at the Tokyo campus of Tsukuba University.